Vincent Kompany is likely to sign a contract extension at Manchester City, with growing confidence that he will prolong his stay into a 12th season. Discussions have been ongoing with Kompany over a new one-year deal and all sides – including manager Pep Guardiola – want to thrash out terms. The City captain is expected to agree a cut in wages, with a desire to remain at the Etihad Stadium trumping any financial implications of his injury record. Fitness issues have blighted Kompany throughout Guardiola’s time in charge but the central defender has continued to impress when called upon – most notably during last month’s win over Liverpool. The 32-year-old has not featured since then, however, and has made only 14 appearances this season. 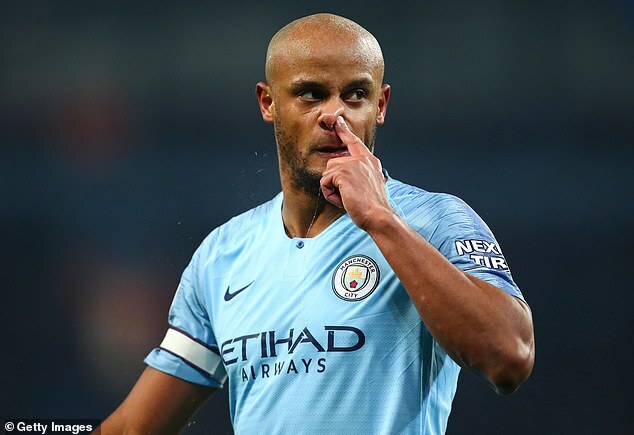 Kompany said that nobody is making ‘hasty decisions’ over his future, although there is an expectation that he will be at the club come next term. Kompany is currently in his testimonial year and donating all profits to the Tackle4MCR charity, which helps the area’s homeless and rough sleepers. Last week’s gala dinner at the Hilton on Deansgate raised more than £200,000. The year will end with a testimonial match in August, for which Kompany hopes to invite back a collection of former team-mates. The Belgium international has spoken about the potential of Nigel de Jong, Mario Balotelli and Pablo Zabaleta making returns.